Wow. 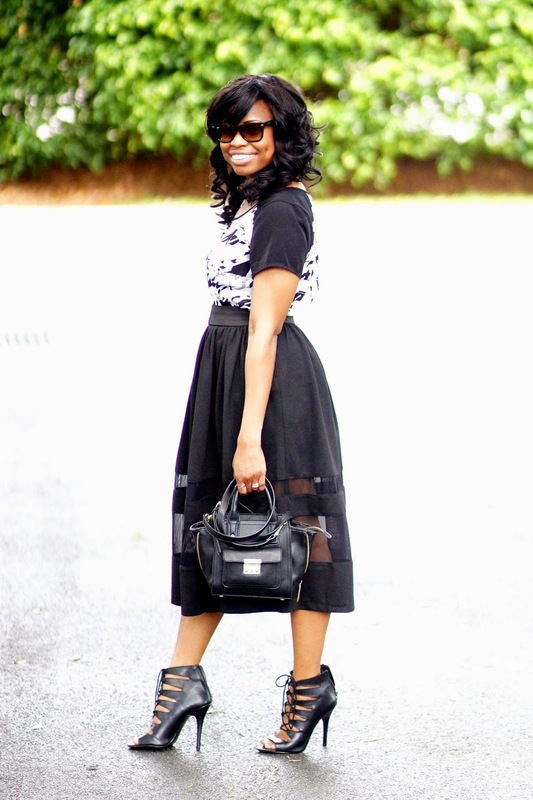 Did I really just title this post "Midi-Chlorians" because of this awesome midi skirt? Yep. I so did. This isn't my first Star Wars reference on the Muse and it won't be my last either. Google the term if you don't know what I mean. When I first bought this top in 2012 I knew it had potential. I just couldn't really see it at the time. So I decided to pair it with this recently bought midi skirt. And then the clouds opened up and god said, "yaass!" (because god is an all knowing, fashionable woman). I took these photos during my recent trip to Florida on Las Olas, which is like a trendy downtown near the beach complete with hotels, restaurants, interesting stores and the occasional police on horseback. Hahahaha....awesome title. May the Force be with you. LOVE IT--- the look and the reference... you are too cute!!!! Great look. That skirt looks great on you. LOVE the title of this post ;) The skirt is so amazing! I would totally wear this one. Btw, for Shag Marry Kill, there are decent female options in the Walking dead unlike the other Shows. fab outfit!! love the midi! and the title of this post. haha! I absolutely love this skirt. So chic and those shoes, perfect! Great outfit! You know I appreciate a good midi skirt, and guess what. Love it lady, Happy Monday! This looks lovely on you! I love the skirt and the shoes are perfect with the rest of the outfit! Love the title and the skirt! Ooh la la! That skirt is amazing...and I keep debating about buying a pair of shoes very similar to those by JustFab...hmmm, you've got me thinking about them again. Lol. I love the first photo! And very lady like with the midi length but cool with the graphic print and cut out sandals. In love with the peekaboo midi! what a fun piece! first time on your blog and the look! i've been eyeing a similar pair of booties - first at zara and now on justfab - and think i am now sold! You look great in that skirt! I also love the shoes! You are amazing and so beautiful, dear friend. Gorgeous look! I actually thought this was a dress, rather than a skirt + top. They really ARE a great combo!